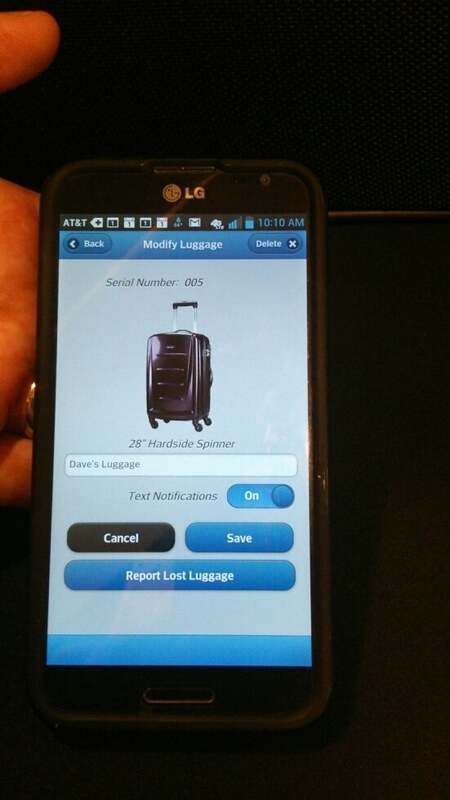 AT&T researchers have developed a “smart luggage” tracker that would help travelers find their bags, showing off the device during an event that also highlighted the company’s push into the Internet of Things. 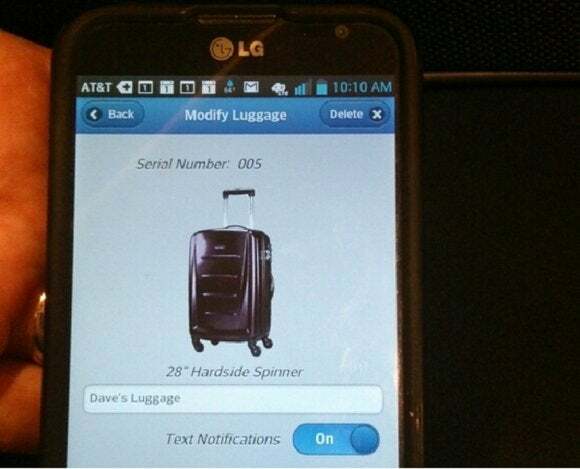 The tracking device, which fits inside or is attached to luggage, pinpoints the location of a bag in real time. Users could track the movement of their luggage through software on a mobile device, said David Marten, principal hardware designer at the company’s machine-to-machine foundry, during the AT&T Innovation Showcase Friday in New York. For example, if a bag doesn’t arrive at an airport baggage claim area, a user could map out where it is in the airport. It could also tell if the bag is in another city. The application could also send text messages at specific intervals for when a bag lands and the tracking device could also light up a bag at lost-and-found or on a carousel. The tracker in the bag could work internationally by connecting to other 3G-compatible networks. The tracker is a prototype that Marten said illustrates how AT&T’s network could be used in devices. It’s part of a larger move to boost the company’s presence in the Internet of Things space, where data-collecting sensors and instruments are connected. “When it will be a marketable device, we don’t know yet,” Marten said. AT&T also showed off a number of projects where connected devices automate mundane tasks. For example, after a car pulls into a driveway, a sensor device automatically sends instructions to switch on air conditioning, shut off the security system or switch on lights. The services are being researched for integration into AT&T’s Digital Life home automation and security system. AT&T wants to be a broker for sensor devices to exchange information over its wired and wireless networks, said Marian Croak, senior vice president of applications and services infrastructure at the company. The demonstrations were part of what the company calls rapid prototyping, where ideas are tested and deployed in quick time, Croak said. As more sensor and wearable devices connect to the Internet, the company is building out network capacity, virtualizing networks and adding Wi-Fi networks and small cells to handle the increased communication. AT&T is also making changes at the data-center level, switching from proprietary hardware to commodity hardware so software-defined networks are easier to deploy, Croak said. There is sensitivity to latency for specific applications like voice and video, but the improvements will progressively become visible to customers, Croak said. For example, companies will be able to assign levels of bandwidth to specific applications or departments. “It’s not only that the applications will become faster, but applications can be customized to your liking,” Croak said.